Streaming royalties tool allows you to check an estimated amount of royalties artists get from your usage of popular streaming services. Music streaming services such as Spotify, Apple Music or TIDAL have been growing rapidly in the recent months and years and it's hardly surprising. At the price of 5-10 dollars per month (depending on your country and type of service) you have access to virtually unlimited source of legal music on basically any device. What's also important for many - artists finally get paid for their hard work. Can they make a living from these, seemingly, tiny royalties? Information about the actual size of royalties has been hidden behind complex equations which often also involves company revenue, making it impossible to get precise figures. Some companies, such as TIDAL, have been bragging about paying multiple times more than services such as Spotify or Apple Music, attracting plenty of artists for exclusive deals. Numbers such as $0.0011 or 0.0073 per song played still seem quite vague for many so we built this tool to help you estimate how much artists could be grossing thanks to you. We based the royalty fee numbers on the following chart from informationisbeautiful.net. Please note that those are only approximate fees and they might change on a frequent basis, if you have some more up-to-date data - please let us know. We assumed the average duration of a song is 226.93 seconds (3 minutes and nearly 47 seconds) based on the research from StatCrunch. The weekday/weekend separation is there because you might have a completely different "listening schedule" depending on whether you are at school or work. You may be wondering - if I listen to the music 24 per day, does my favorite band receive 24 times more as if I was doing it just for an hour per day? The answer isn't either yes or no. It's rather it could be, because with such a large scale it doesn't really matter. What makes sense and what's been communicated by them is that they share a certain percentage of their revenue with artists. This is a bulk part of their gross margin. With the kind of numbers that they get, it doesn't really matter if John listens for 4 hours, Jane for 2 or if they both listen for 3 hours. Ideally, artists' cut of my ten bucks should be distributed among them proportionally to how much I've listened to their songs, but simplifying it in this way is a reasonable approach. 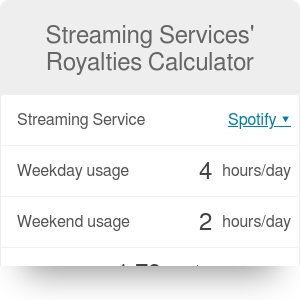 Streaming Services' Royalties Calculator can be embedded on your website to enrich the content you wrote and make it easier for your visitors to understand your message.